Equities start the day higher as the S&P500 makes new highs! That’s right, new highs my friends, don’t be fooled into thinking price is all that matters. 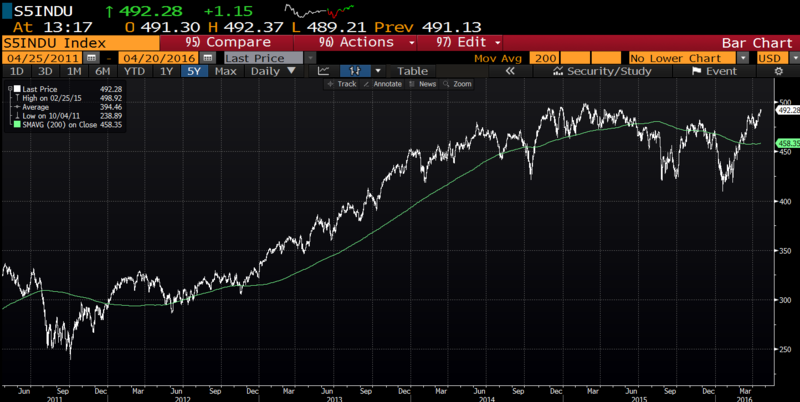 As the ever informative @ukarlewitz points out, the S&P500 Total Return Index has reached a new high water mark. Total Return Index you say? Yep, #dividendsmatter. I mean shouldn’t we look at both price appreciation AND dividends when it comes to investing? It’s not like we can exclude them, they do provide vast swaths of investors real money to spend on things like nachos and inflatable pool toys (my mind is still on Spring Break). 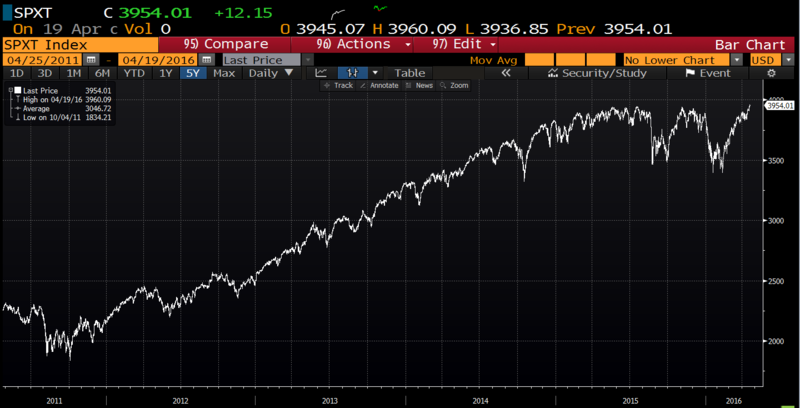 So will the actual S&P500 index catch up to its holistic partner? Probably, but it feels like things will get a bit tougher from here. We’ve rallied 15% from the February lows without any meaningful pullback to reset the bar and honestly, how often does THAT happen? Sentiment, while not ragingly bullish, has become a bit of a headwind too. II Bulls are at their highest level of the year (47%) and Bears have dropped to 21%. So it’s not like we can say “no one is bullish take ‘em up” without feeling a bit disingenuous. Earnings, what about earnings you say? Well, at this point they are “better than expected” but it’s still fairly early in the season (RBC put out this blurb today: 17% of the S&P’s market cap has now reported (60 names). So far EPS has beaten by an average of 4.5% vs. expectations of loss of 6.9%). Oil, what about oil you say? Well my friends, I wonder, can we actually describe the current level of oil prices as “Goldilocks”? At $40 its still low enough to provide relief to everything from consumers to airlines and at $40 it’s no longer this giant fire breathing dragon that encompasses every worry about global growth. Is $40-$50 the sweet spot? It might just be. Anyway, new highs and no one is talking about it! Perfect, let’s keep it that way! After the open it felt like we were going to have a “go nowhere, do nothing” day. The first hour or so was spent bumping up against resistance around the 2,100 level. I went so far as to say the market “felt like it was on mile 19 of a marathon” on Twitter because exhaustion was rampant. But no…no…this one will not be held back by a lack of Power Bars and blisters on its feet. We gave 2,100 the laugh and pushed higher thru lunch. Existing home sales beat expectations and if you are in the market to sell a home get out there my friends, there’s profits to be had! Sellers of US Homes are reaping the biggest profits since 2007! Who wants an 80-10-10 mortgage and a 5 bedroom home in Port St Lucie? THIS GUY. Intel announced they would lay off 11% of their workforce and the stock rallied 1.2%. Just goes to show you that stone cold efficiency is still embraced by the street. Other winners were DFS +8% (who has a Discover card? Honestly I’ve never owned one and I’m 42), TXT +4.8% (earnings), CHK +4.9% (up like 82,485% since Feb because the whole world sold it over the past few years), and YHOO +4.1% (because nothing says “buy me” like a company running a messy asset sale process). Losers were mainly Utilities and safety plays like KO (earnings viewed as disappointing) and HSY (Easter is over, time to move on I guess). Honestly, the rotation from boring / safe / dividend back into risk has been breathtaking. Names that no one would touch with a 50 foot pole are all of a sudden hotter than San Francisco real estate. Industrials, which were in a “Recession” two months ago, are near all-time highs. The fickleness of market is absolutely epic. Hey isn’t today 4/20? Man the only 420 I know is my weight, who are these people. The back half of the day saw the market drip drip drip lower as the dollar churned churned churned higher. King dollar, the great arbiter of risk nowadays, guess you have to have it on your screen if you wanna know what people are thinking. We closed at 2,102, only slightly higher on the day but still in green numbers. So I guess the beat goes on. We continue to see a rotation away from the things that worked (staples, utils, telecom) into the stuff that moves like a Tesla in ludicrous mode. Does that rotation smell like chasing? Sure, a little. 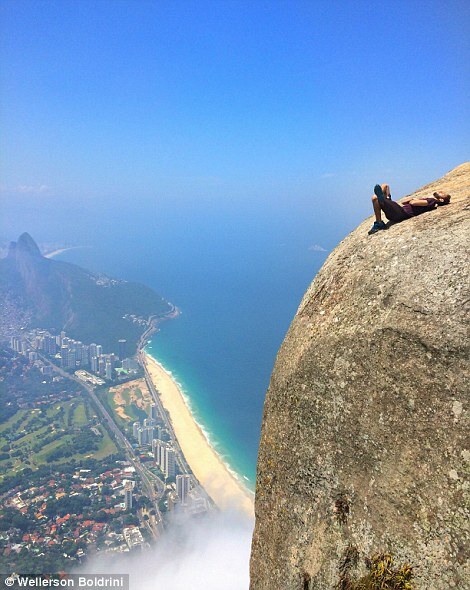 When you see “risk on” trades AFTER a huge move it does make you wonder what investors are thinking. Are they reaching or is this the start of a fresh breakout? No one knows but can you blame them? What happens if this thing keeps going, how can someone explain their love for Utilities when Cyclicals are up double digits? How can you explain your love for tissue paper when earnings aren’t as bad as people expected? Oh well, guess we wait and see what the future has in store. For now the market and its participants are slowly re-embracing risk and it has brought us to new highs (technically true, don’t tell me dividends don’t count). Succinct Summation of the Day’s Events: Initially felt like a “go nowhere” day. Ended up grinding higher anyway. Oil continues to rally, Bonds continue to sell off. You know what else? They are having trouble saving for a home: “Our research indicates that the vast majority of millennial renters (79%) want to purchase a home, but that affordability is the biggest obstacle that they face. We estimate that many renters will need a decade or more before they can afford a 20% downpayment on a home” So here’s my question to you…how is this any different from what we faced? Or the generation before us? Everyone wants to own a home some day and no one ever has enough money for their first down payment. That’s just how it is. Millennials are just normal people facing the same problems everyone else did at one point in their lives. Let them be, I guarantee they’ll figure it out. How far is this guy from death? Inches right? What cities are booming right now? America's Top Boom Towns are demonstrating some of strongest growth in jobs, household formation, and housing starts across the country. Every market on the list has experienced between one and five times the average job growth of the top 100 counties in the country. Portland is in there! I love Portland. 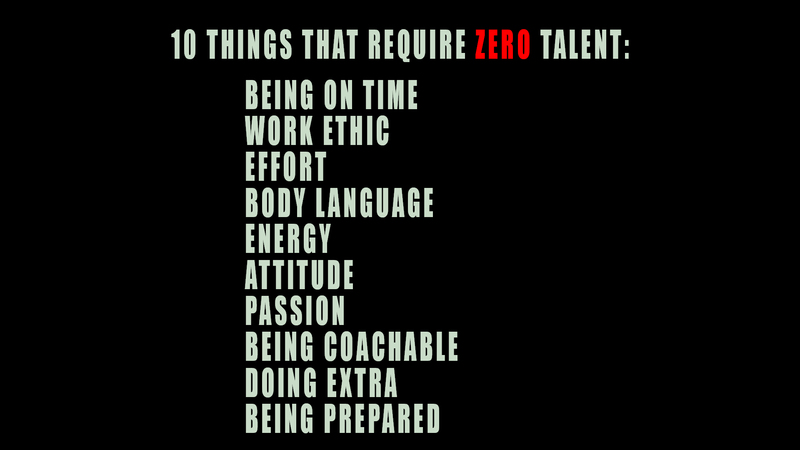 10 things that require no talent.